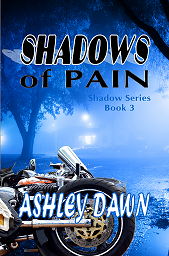 Today I have the privilege of welcoming Ashley Dawn, author of the Christian Romantic Suspense book: Shadows of Pain (Shadows Series book 3). Ashley is guest posting here today. It wasn’t like she wrote them down then read them, she told them ‘off the cuff’ and they were great! One was about ‘The alligator that got flushed down the toilet’ another ‘The Leaf that Ran Away From Home’ and they kept us laughing. I think that was the best thing she could have ever done. Each story had a moral and a life lesson. The fact that she would get us all together and entertain us was just great. I think she had as much fun in the telling as we had in the listening. It made me want to entertain people that way. Revenge is sweet….unless you are on the receiving end of it.